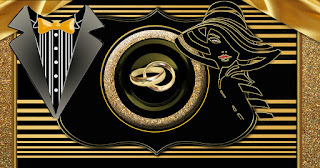 Watching the 2013 Great Gatsby movie inspired me to create my own Gatsby style by using a luxurious shimmering gold silk texture draped through two wedding rings on a dramatic black background with a Deco style stripe to give the design a chic and glamorous look. It should exude a sense of purposeful luxury in no uncertain terms. Gatsby style is all about dramatic and eye-catching details. The luxurious Art Deco style is making a comeback in a big way! Some couples like to choose a trendy style that their guests will relate to. Art deco has influenced a lot of couples even today to use for their most important celebration. A wedding should be one of the most special occasions in your life. One way to make it even more special is to add personal touches throughout the entire process with gifts for your wedding guests that can all be personalized at Zazzle. Unlike today, men wore tailored suits to fit snug on the body. Black tuxedos and sparkly sequined dresses are a modern way to do 1920s wedding attire. When choosing a 1920s suit, find one that fits well, not baggy. A matching suit vest and pants are a must for a Great Gatsby look. A French cuff white shirt with cuff links is a must! ...I love the look of the white collar shirt for ’20s wear. It screams vintage. Don't forget the very important vintage style shoes. Color-wise anything goes. There's no such thing as too much sparkle. Bridal frocks of the Jazz Age were the epitome of footloose and fancy-free. They were shorter, reflecting the popularity of the flapper girl look. Brides also wore long-strand necklaces, oftentimes pearls layered around their neck. Here is some great 1920’s inspiration from zazzle designers. A shimmery black tablecloth layered with embroidered gold linen, including The couple's initials on plates, wine glass charms and wine bottle labels. The opportunities are endless. Personalize with the wedding couple's names and wedding date, and be sure to include a special message! Decadent cookie favors make the perfect post-wedding treat. Box them up to make it a matching gift set so they're easy for guests to grab and go!